For some people the new tab page in Google Chrome isn’t necessarily the most useful thing. I tend not to click on the thumbnails for my most visited sites because they all appear in the bookmarks toolbar that I have visible at all times. I’m sure there are plenty of you that make heavy use of it, but I prefer to test out extensions that replace the new tab page to see what might work out better for me. One that I’ve really come to love is called Currently. 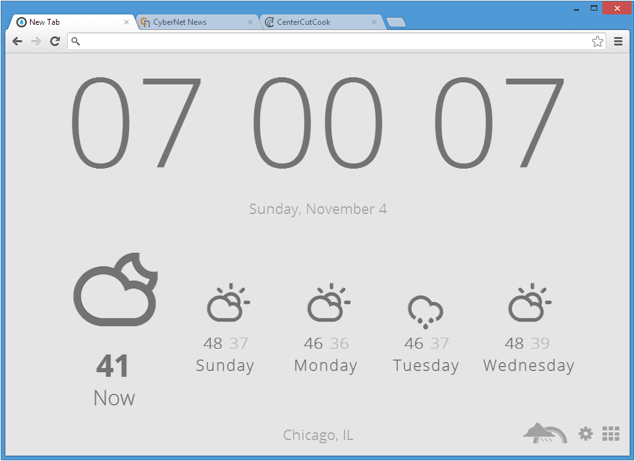 As you can see in the screenshot above this extension displays the current time, date, weather condition, and weather forecast. The interface is very minimalistic, which is one of the things I love the most about it. What is really awesome with this extension is that you’ll always have the default new tab page for Chrome just a single click away. The icon you see in the lower-right corner that looks like a grid of squares will temporarily let you view the default new tab page. 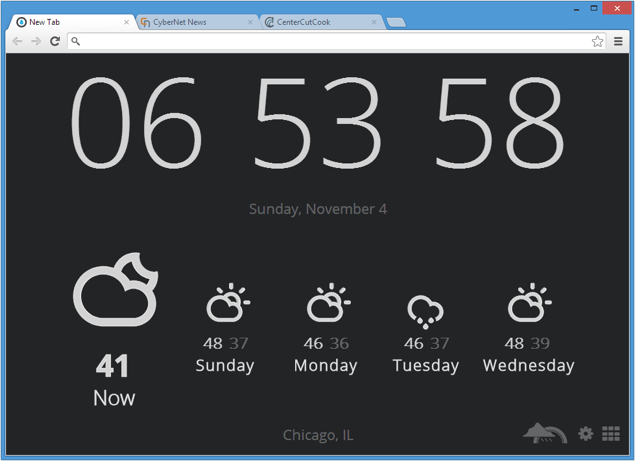 The next time you open up a new tab it will still fall back to the time and weather display by Currently. That’s an excellent approach to giving users something fresh without taking away something they might need access to.